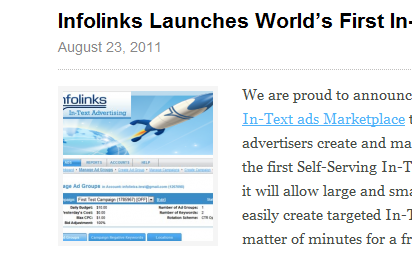 Infolinks proud to announce the official launching of their acclaim World's First In-Text Ads Marketplace. It is the first self-serving in-text ads by Words that advertisers would loved. By the way, what is Infolinks? Infolinks is a leading provider of PPC In-Text Advertising services. Infolinks enables website owners and online content publishers to benefit from premium contextual ads. Infolink's In Text Ads expose online visitors to highly relevant content, don't require any additional space on the websites and are quick and easy to integrate. Established in 2007 and backed by Primera Capital, Infolinks leads the industry with an attractivebusiness model and guarantees the highest revenue sharing basis to all partners. Since the company's incorporation, thousands of websites have been integrating Infolinks In-Text. Features in Self-Service In-Text Ads? How to Open an Advertiser Account? Infolinks said in a blog: Opening an advertiser account in our Marketplace is simple and will only take you a few minutes to complete. Simply visit our Marketplace, complete a short registration form, fill out your billing details and then activate your Infolinks campaign. It’s really that easy. P.S. 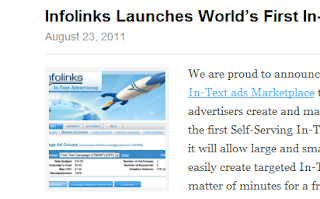 Im one of the publishers who uses Infolinks' service and i would firmly say that Infolinks is a best In-Text Ads! And it has a BIG Revenue!